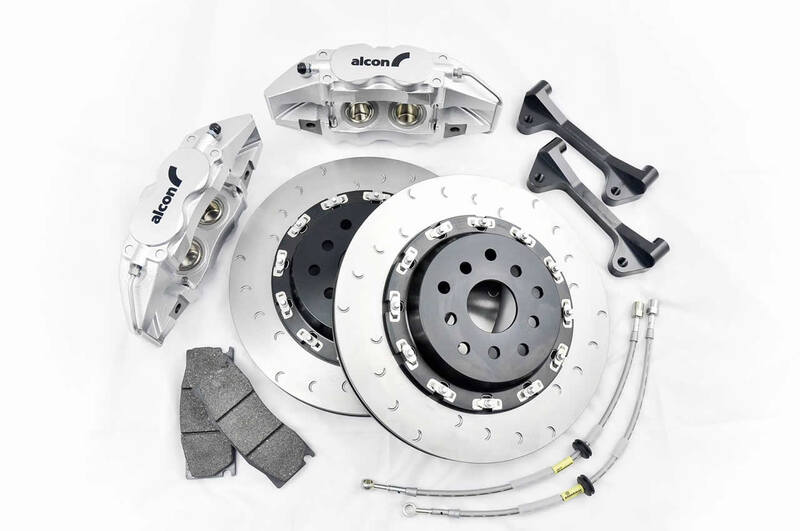 The Alcon Big Brake big brake kit from Paragon features the highest quality rotors and calipers you're used to from Alcon braking products. Assembled in the United States it features a unique T-Slot design and semi-floating rotor that offers the benefits of a full race setup but without the noise associated with full floating rotors. This is a complete kit to instantly upgrade your cars braking performance and safety as well as provide a performance platform for the track-addict. Alcon uses the exact same components on these kits as on the professional racing programs. This means you are getting the same rotors, hardware, hats, etc... from the same factory in the United Kingdom. Alcon crescent slot discs have been engineered to produce optimum bite, thermal stability and durability in an exceptionally high strength to low weight design. This has been achieved by combining a special Alcon developed iron alloy disc with an aerospace specification alloy bell. Unique crescent grooves on friction faces provide the bite usually associated with drilled discs without the durability problems. Directionally curved cooling vanes for optimum cooling performance. Monobloc 4 or 6 piston design for high stiffness and low weight. Piston bore sizes are staggered to ensure even pad wear.